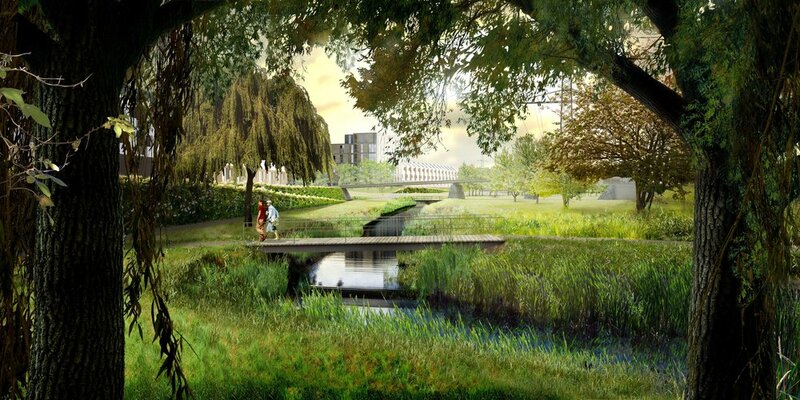 Working with architects Sheppard Robson and Maccreanor Lavington, Gustafson Porter + Bowman’s landscape proposals for a 185ha brownfield site in the Thames Gateway demonstrates land remediation of a former polluted site using techniques such as sustainable urban drainage. The design seeks to create a collection of open spaces including large parks, green corridors, public squares, communal courtyards, streets and private gardens whilst opening up 2km of riverfront. 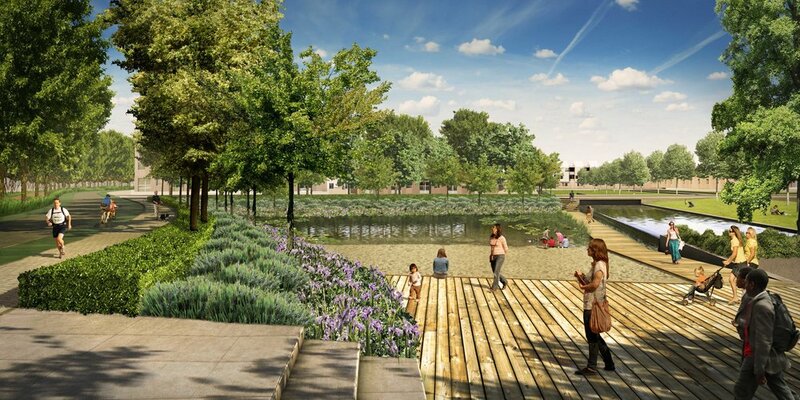 These outdoor spaces comprise more than 40% of the site and support the ambitions of the masterplan to improve transport connections, enhance community facilities and deliver office space, schools and more than 10,000 homes alongside the River Thames. Our designs are distinctive and balance the client’s ambitions for biodiversity with the human wellbeing and safety within the urban context. The site’s location at the downstream end of existing creeks combined with its close proximity to the tidal River Thames creates particular sensitivity to future flooding events. Our design proposals transform this risk into an opportunity by including numerous measures to reduce flood risk. This includes rainwater harvesting, green roofs, planted swales, and water storage ponds which are capable of storing and slowing down surface water run-off. It proposes a solution which restores this former industrial site to its former function as a floodplain within the existing East London Green Grid ecological network. Together with the green corridors through the development and the incorporation of large street trees, the park area surrounding the development helps to establish sheltered local micro-climates. They contribute to the reduction of the urban heat island effect. Additionally, the landscaped areas provide space for recreational areas, picnic zones, community gardens, walking trails and opportunities for informal education.